Russet is one of the most versatile types of potatoes, suitable for frying, mashing, baking and roasting. They are often called Idaho potatoes after the top producing state that grows roughly 11.5 billion lbs. of them each year. Russet potatoes are relatively low in calories, with only 160 calories in a medium potato. The Centers for Disease Control and Prevention also labels them as a good source of dietary fiber, vitamin C and potassium. Wash the potatoes thoroughly. Peel the potatoes, if desired, or leave the skin intact. Cut the potatoes into 1.5-inch chunks. Place cut-up potatoes into a large pot filled with salted water. Set over high heat, cover and bring to a boil. Cook the potatoes for five minutes from the time the water boils. Drain and set the potatoes in a large bowl. Allow the potatoes to cool. You can make the potatoes to this point up to one day ahead of time if you keep them in an airtight container in the refrigerator. Pour 2 to 3 tbsp. olive oil into the bottom of a roasting pan. Add the potato chunks. Season with salt and pepper. Toss the potatoes with your hands, evenly coating them with the olive oil and seasonings. Place the potatoes in the preheated oven on the middle rack. Roast the potatoes for 30 to 40 minutes until golden brown; turn the potatoes with a spoon once or twice during the cooking process. Add chopped onions, green bell peppers, garlic powder and paprika to the potatoes before roasting for a flavorful side dish. Give the cooked potatoes a fresh-from-the-garden taste by topping them with fresh herbs. Never freeze or refrigerate raw russet potatoes. 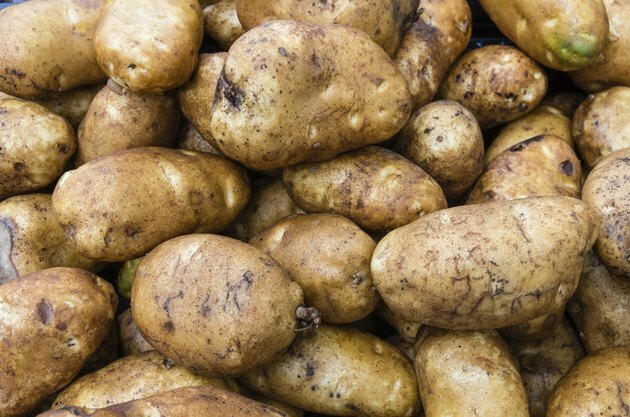 Store them in a ventilated, dry space kept between 45 and 55 degrees F. Russet potatoes have a high starch content that will turn to sugar when they become too cold. Diabetics should avoid white potatoes in general, as they have a relatively high glycemic index rating of 76. How Many Calories are in a Yukon Gold Potato? Can I Roast Potatoes at a Lower Temperature for a Longer Time With Good Results?